Nemesis of the Roman Empire Game Review - Download and Play Free Version! Command Forces From Rome to the Iberian Peninsula in This Epic War Drama Taken From Roman History! 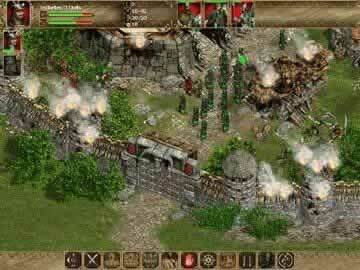 Nemesis of the Roman Empire is a Roman era real time strategy game that is inspired by real battles fought throughout a fascinating time in Roman history. Be involved with some major civilizations - from the Romans to the Carthaginians to the Guals or Iberians. Choose wisely which race you are going to be, for your very life could depend on your choices. Nemesis of the Roman Empire is unique in the fact there is no base building whatsoever. All of your time, energies, and money are spent on the building of units and fighting your battles. No need to spend all day building towns when you have battles to fight and lands to conquer! You will command up to 50 military units and build 30 or more settlements. You will need to gather the necessary food and gold to wage the war against your foes. Nemesis of the Roman Empire picks up where the award-winning Celtic Kings: Rage of War left off. Nemesis of the Roman Empire is a real-time strategy title which lets you command Rome's mighty legions, the savage warriors of Gaul, the proud Carthaginians, or the powerful Iberians. Nemesis has some rather interesting and unique gameplay elements that set it apart from other games in this genre. For starters, there is no real base building and the focus is mostly on building your army, upgrading your heroes, capturing villages and forts, and conquering your foes. The really intriguing and unique part is how you gain resources and the logistics involved. In order to gain more resources you must capture forts and villages to get a steady supply of food and gold by mule back in order to increase your settlements' populations and train more soldiers. Most of the action in Nemesis therefore surrounds capturing these outlying colonies and protecting them from attack, but you also must defend your supply lines since your mules can be attacked or even stolen. You must also keep your troops fed or they will lose combat effectiveness which means you must bring along enough mules to keep your men moving. This all adds together to make some rather interesting and fresh strategies and tactics. Another nice element is that the AI is rather intelligent and will use clever strategies to defeat you. For instance, it will probe your borders for weak points, attack weakly defended forts over heavy fortifications, and will try to draw your sieging units into range of its towers. There aren't too many problems with Nemesis, at least ones that affect the gameplay. The graphics do seem a little dated and the units have somewhat awkward walking motions. Also, the cutscenes are rather simplistic and the text boxes do little to draw you into the story. 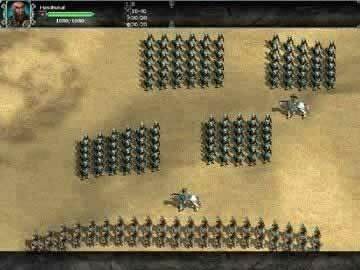 The only real issue is with large armies and some problems in controlling them. For instance, there are times where half your army will attack nearby enemies while the rest sit idly by only a few feet away which was frustrating. Overall, Nemesis of the Roman Empire provides a fun and entertaining RTS experience that has enough variety and unique gameplay elements to make you want to keep playing. With two lengthy campaigns, a robust skirmish mode, and online multiplayer options, there are hours upon hours of playtime to be had. The useful interface and variable difficulty make this a great title for new players to sink their teeth into this addicting genre and has enough depth to attract more hard-core fans.